One thing new and even experienced pond owners need from time to time is pond advice. We have years of experience in all aspects of pond keeping. Chances are, that if it can happen, it has probably happened to us, and we have found a solution to the problem. We have taken the time to write down some helpful pond advice, tips and information on some of the more common questions that people ask us. Algae in the Pond – Algae is one of the most common pond problems. Here are a few effective ways to solve get rid of algae. Green Pond Water Fix – an in depth look at controlling one of the most irritating types of algae that grows in ponds. Clear Water Plants – a guide to the most effective aquatic plants to keep your pond water clear naturally. 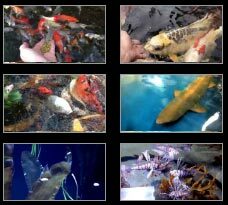 Acclimating Pond Fish – An informative video with tips on choosing and acclimating your new pond fish in your pond. 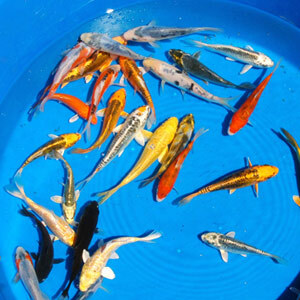 Feeding Koi At Different Temperatures – Temperature plays a very important role in how much, how often and the type of food you feed your pond fish. How To Train Your Fish To Eat From Your Hand – Your fish will be eating from the palm of your hand after reading this. Important Pond Temperatures in Spring – Spring is a critical season for your pond, especially with regards to pond temperatures and koi and goldfish. Koi Spawning Behaviour & Development – Here’s what you can expect to see if your fish spawn. 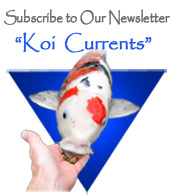 The Best Way To Dissolve Praziquantel & Treat Flukes – Ho to easily dissolve praziquantel and treat flukes in koi and goldfish. How to Choose The correct Size Pond Tubing – Choosing the correct diameter of tubing is crucial in how well your pump will perform. How To Select A Pond Pump – Tips on what to look for in a pump and how to select the proper size. Winter Pond Cover Design – Here is a description of how to build a winter pond cover. Large Pond Algae Control – algae can be a pond owners worst problem. Here is a look at the different types of algae and how to control them.